I think I’ve made my feelings toward breading chicken rather clear, yes? If you’re just now tuning in, here’s the summary: It is gross, and I am bad at it. And yet, there’s something about it that keeps me coming back. Obviously, breaded and fried chicken is tasty, but combine that with my penchant for a good cooking challenge and suddenly I’m mushing raw chicken around in breadcrumbs while scrunching up my nose. So, today I’m back to breading chicken, and for a twist, the coating includes almonds. Very tasty, and believe it or not, fairly easy to get right! See, not only am I loathe to handle the raw chicken, I’m also really terrible at cooking the chicken all the way without burning the breading. 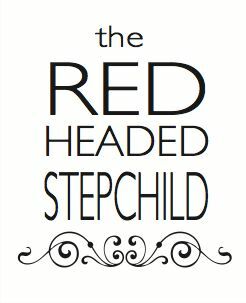 This recipe gets around that issue by using a cast iron skillet to briefly fry the breaded chicken on the stovetop, then popping the whole shebang in the oven to cook through. The recipe comes from that old Cooking Light magazine (I’m getting my money’s worth out of it six years later, yes?) and starts with half a cup of buttermilk. Except I never have buttermilk on hand. I just stir in half a tablespoon (stir fast! no curdling!) 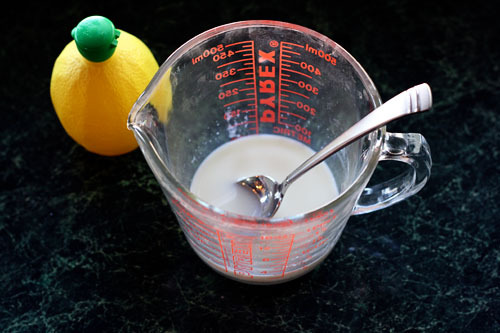 of lemon juice into regular 1% milk, let it sit a few minutes, and it’s good to go! 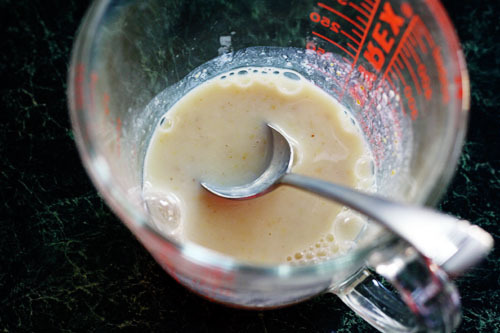 Then the recipe called for two tablespoons of honey mustard, stirred into the buttermilk. Mr. P doesn’t like honey mustard, so I used spicy brown instead. Then it’s time to prep the chicken. 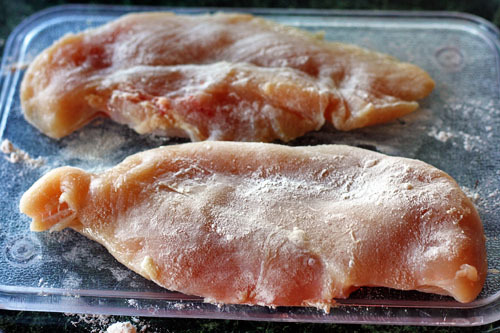 Rather than pounding two chicken breasts flat (Mr. P and I don’t each need an eight-plus-ounce chicken breast for dinner), I sliced one breast in half lengthwise, and dusted both halves with flour. I also sprinkled both halves with salt and pepper, but I forgot to take a photo of that. 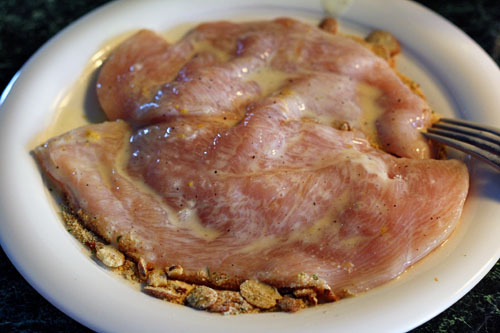 Now, to dredge the chicken in the buttermilk-mustard mixture, you could pour the liquid into a shallow dish. 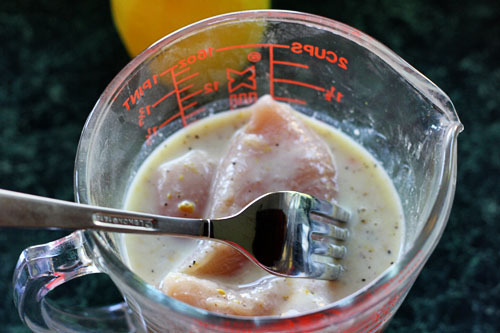 Alternatively, you could take my slapdash approach of cramming the chicken in the liquid measuring cup. With a FORK. Duh. NO FINGERS! Now it’s breading time! 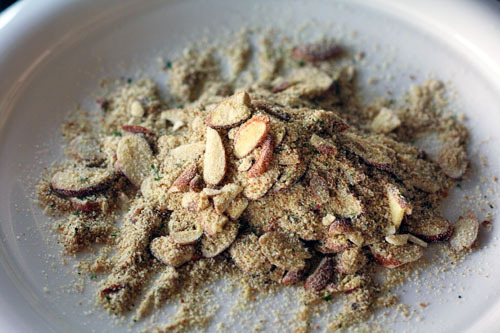 The breading mixture, according to the recipe, consists of two-thirds of a cup slivered almonds with half a cup of breadcrumbs (I only have the store-bought seasoned kind). I don’t know if those are the exact amounts I tossed together because, you know, I used SOME. Then I used my fork (NO TOUCHING!) 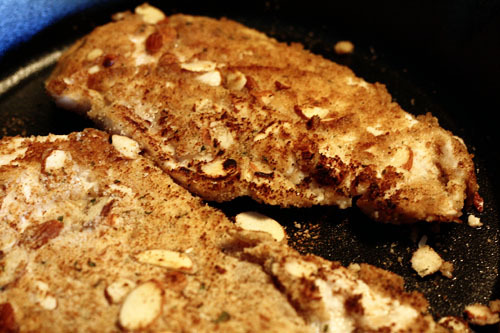 to pull the chicken out of the buttermilk and coat it with the breadcrumbs and almonds. Once it’s coated, it’s time to cook this chicken using the nearly foolproof method I described above, which really needs a cast-iron skillet (or other oven-safe skillet, I suppose). I coated the skillet with cooking oil (I used olive) and gently cooked the chicken over medium heat for ONE MINUTE. Just one! Then I flipped it, and cooked for just ONE MORE. It’s crucial to keep the heat on medium and cook for just two minutes (total) on the stovetop, or you risk burning the almonds. And have you ever tasted burnt almonds? Yeesh, bleeechhh. But just two minutes of cooking time means the chicken is still raw inside, of course. So, it goes in a 450-degree preheated oven for about nine minutes in the same skillet (or transfer to a oven-safe dish if you don’t happen to own a cast-iron skillet). My chicken was fairly thin, and it was done perfectly in the amount of time! You guys! I am getting better at this breading thing! And I barely had to touch the chicken! 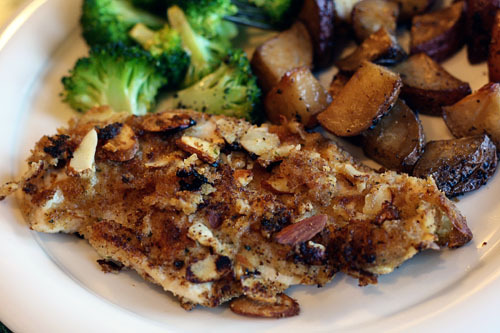 Mr. P and I both enjoyed this dish, and thanks to the fact that the recipe came from Cooking Light, it’s pretty easy on the calorie count – especially when served with potatoes and roasted broccoli! And better yet, aside from the slivered almonds, it’s very nearly a pantry meal. You could even use it on pork, if that’s what was on sale at the grocery that week. AND it comes together quickly! If you’re craving the crunch and flavor of fried chicken, this is easy enough to throw together without the mess. Enjoy!